My first Amazon.com review. The reviewer does not ignore my shortcomings but he still found it worth four stars. Up to now this blog has been exclusively about my own book but there's only so much I can say without being repetitious. That's why I'm blogging my trail journal. It offers something a bit different, although closely related. Somewhat of a side trail. A definite side trail will be capsule book reviews. Not necessarily related to the AT or hiking. Just because I read and can write about it. So here's the first one. Non-fiction. War doesn’t get any more intimate than as seen in Peter Englund’s history of First World War. Englund makes no attempt to understand the war’s causes or significance. Instead he follows lives from August 1914 to November 1918. The dramatis personae are officer and enlisted, reluctant conscript and enthusiastic patriot, cynic and idealist. There’s even a Venezuelan cavalryman and a 12 year old German girl. Only two Americans are part of the story, the American wife of a Polish nobleman and an Army field surgeon, a reminder of how limited was American involvement. All kept war time diaries which Englund mines for the daily detail of a war that spanned France, Belgium, Germany, the Balkans, Middle East and Africa. This detail is combined with extensive research on the war’s social and economic impact, military operations, weapons and tactics to give the reader a granular account of an event that of far eclipses its many individuals. It is this detail that allows a reader to experience that war as an individual. At that level, the story is timeless. The words of 1914-1918 echo those of many previous wars and the Great War’s many successors. As promised, a journal entry. This is from a pre-Appalachian Trail shakedown hike in Arizona's Mazatzal Wilderness with soon-to-be AT partners, Red and Gary. Camped along Deer Creek on our final night out. Had glorious walking along the Mazatzal Divide Trail from last night's camp at Windsor Seep. Not much elevation change but excellent views [all the way] from the San Francisco Peaks to the Superstition Mountains. The trail crossed the divide numerous times and wound in and out of side drainages. At times it was rocky but it was often a bed of pine needles that was gentle on my feet. Some of the drainages were cathedral-like with soft light filtering through the tress. Last night's camp was dry so we melted snow for water which gave us enough to make it to Deer Creek. That spot did offer a grand view of the last sunlight on Mazatzal Peak. Tonight we're in early with some water close by. 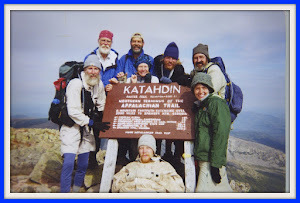 The 2012 thru-hiking season on the Appalachian Trail is underway. Check out trailjournals.com and you will see a few folks already on the move and plenty more getting ready to head for Springer Mountain. I normally think about the trail and thru-hikers along about this time of year. Those thoughts will pop into my head now and then come to me between March and October. I will remember where I was and with whom I traveled on the same day in 2002. I've had some adventures since that year but thru-hiking the Appalachian Trail still resonates in my mind. Mentally and spiritually I still feel the trail. The immersion in nature, understanding the ebb and flow of time. On the trail, my partners and I called these the "gauzy and romantic" memories that would linger long after the pain and hardship of thru-hiking had faded, memories that might lead us to do something this insane again. But these days I am not at risk to succumbing to gauzy romance so I can reflect and celebrate a truly wonderful event with no illusions. Since 2012 is my ten year AT anniversary and because I have a book to sell, I will blog my trail journal occasionally in the coming months. The raw stuff. No edits, although I can always comment. That will give this neglected blog some reliable content which might generate some traffic and book sales. I have a many copies copies of At the Speed of Foot that I would like to distribute and this site is a big part of my marketing strategy. It needs content. My journals will do that.